It takes many folks up to 40-80 hours over three to four months to develop their iPhone apps. It’s taking Wendell and I over a year!! That’s Wendell in the picture, by the way. He’s my iPhone app developer. He’s also (thank goodness!) my good friend. Wendell is learning Xcode (Apple’s program that develops the apps) as he works. These constraints have necessitated that we work slowly. In some cases, really slowly. Just as the Slow Food movement is all about really getting into food and the community it engenders, we think we need a Slow Business movement that’s about the quality of work and the experience of doing it –– as opposed to the alternative — namely the tendency to turn work into an ever-escalating arms race of longer hours, quicker email responses, and an obligation to be checking your Blackberry at your kid’s birthday party. This ever-escalating arms race had gotten a bit out of control in my life recently, as I juggled MuseCubes and my growing academic coaching practice. Needless to say, my weekends were wittled down to naught. And I certainly wasn’t enjoying either the quality of my work, or my experience doing it. In the spirit of slow, though, I’ve relaxed my expectations about how much each of these projects will grow this year. I’m still moving forward on all of them, just one small step at a time. Lowering my expectations for how much each of my projects will grow has allowed me to reclaim my weekends, balancing relaxation and adventure (neither of which had been in my life on a consistent basis). As Jerry Stifelman says, slow business enables me to live as if I matter, my relationships matter, and joy matters. Hallelujah! However, slow business can also have it’s downside. Take the iPhone app. Apple is constantly updating its operating systems and app development processes. Since we’ve been working for over a year on this app, we’re constantly encountering technological roadblocks that result from these updates. Often, the first chunk of our twice-a-month work sessions is spent troubleshooting outdated technology. Sometimes we lose the entire four hours to updates! Just today, for example, it turned out that the provisioning profile on my iPhone had expired; we couldn’t move forward until we’d updated it. Luckily, Wendell moved past this road block pretty quickly. However, during our last two work sessions, we weren’t so lucky. Apple had updated it’s version of XCode (the program we use to develop the app), which takes hours to download, depending on the internet connection. Then, we had to coordinate all the new iPhone operating systems with this new version of XCode. Between the downloads and the troubleshooting, we lost about four hours of development time. That’s almost a whole month’s worth of work time. Arggghhh!!! Today, though, we were able to move through our roadblock rather quickly. And the truth is, iPhone app development seems to go pretty quickly without the technical glitches! 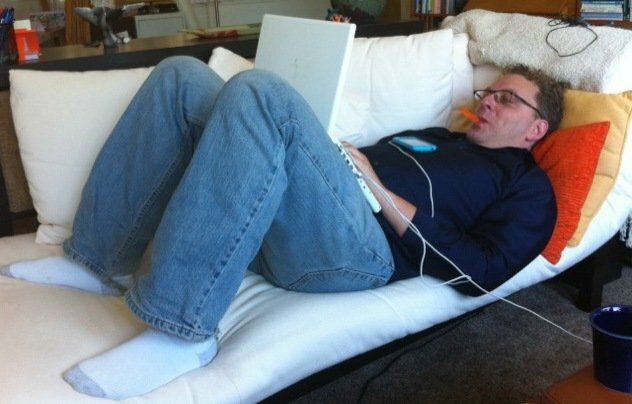 All morning I’ve been writing this blog entry (using Wendell’s Dell laptop) while Wendell’s been lying on my couch working on the app (isn’t that a great picture of him, above?). Me: Hey Wendell, how’s it going? Wendell: Good! Within the next little bit, we will be able to not only download the expansion pack, but have it integrated into the process so that it loads the right sound files. Then we’ll be really close! We’ll just have to plug in Apple’s purchase API. After a little clean up, we’ll be ready to sell the expansion pack! With just 20 minutes to go during today’s work session, we’ll get as far as we can get. And that will be great! Collaboration Can Be So Much Fun!